It doesn’t escape me that every time I post something overtly meat-related, I immediately lose about 20 Instagram followers. Sadly, this is also what happens with every picture I post of Charlie. This makes both of us sad, but perhaps some people just aren’t into hunks of man meat either? Luckily, shellfish hasn’t been quite as offensive, but I’ve still taken your social media behavior as an implicit request to throw more veggie options into the mix. 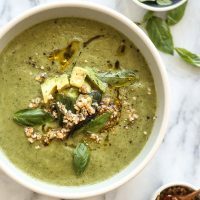 So in honor of Meatless Monday, and in the name of my post-road trip detox, I’m interrupting this month’s #summerseafoodchallenge programming to bring you a creamy vegan zucchini soup recipe. Yesterday’s 6am flight back from Portland, coupled with the end-of-vaca scaries, had me in a huge funk this morning. As it turns out, when New York reaches a level 9 on the swamp-o-meter, it can exacerbate jet lag and somehow reignite the wanderlust that my 2 1/2 week trip out West was supposed to squash. But the big bright spot was getting back in the kitchen. I don’t know if other long-time GF folks feel me on this, but especially when I travel, I have a big scarcity mentality around food. As someone particularly prone to the hangery low blood sugar abyss, this means I usually travel with a minimum of 12 Kind bars and 1 loaf of bread on my person. I lost all shame years ago, no doubt somewhere in the South, and have since been known to argue with airport Quiznos managers until they agree to make me a sandwich with my bread. Preferably, two. Those GF slices are so small, people! But even though I come prepared, finding GF options on a menu still hasn’t lost its novelty. If a sandwich, pizza, biscuit, cookie or [insert carby treat here] shows up on one, my scarcity mentality compels me to order it. And since I found all of those things in Oregon, along with latkes, brownies, and ice cream sandwiches, by the time we made our way to the coast (where they shot Goonies! ), I was feeling particularly Chunk-like. 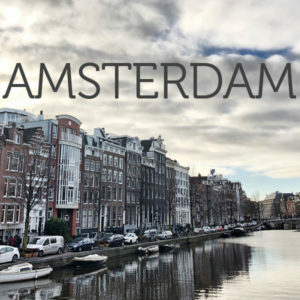 Gluten-free friends, definitely add this part of the world to your bucket list! Just remember to pack your willpower and better judgement. Or, at least, have a bowl of green stuff waiting for you when you get home. 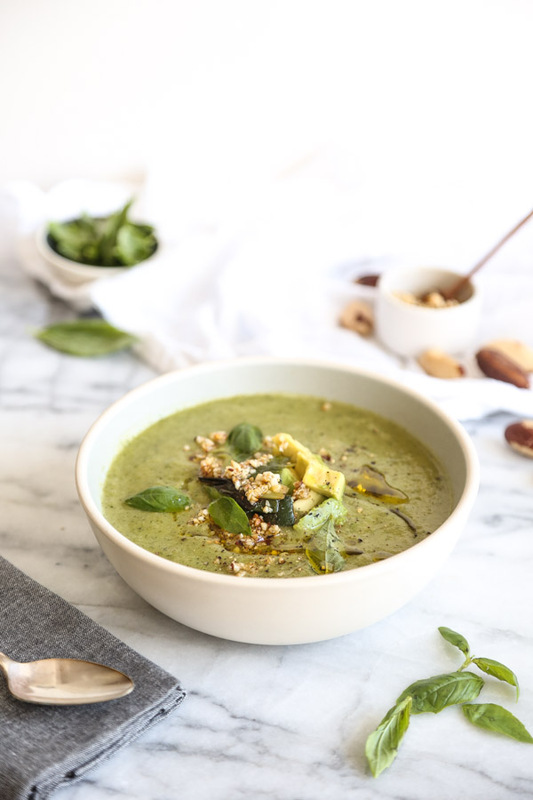 This zucchini soup recipe is a spin on my mother’s classic “detox” soup from my cookbook (the one that also inspired this recipe). She usually purees hers with chard and cilantro. But in this version, I subbed basil and scallions for more of a chartreuse versus evergreen vibe. And to make it extra creamy for my remaining vegan followers, I added half an avocado! Winner winner, not a chicken dinner! You can top the soup with the remaining half if you’re feeling frisky. And because I know you will be, I gilded the lily with a little garlicky brazil nut chili oil. You may remember me waxing poetic about pangritata last week. Well, this is basically the paleo version of that crunchy magic. You can use any nut you like, but being thyroid-challenged, I always try to opt for Brazil. Selenium is critical in the production and conversion of thyroid hormones, and there’s no better source than this nut. It’s basically a complete thyroid supplement. Take note, my Hashi Posse! 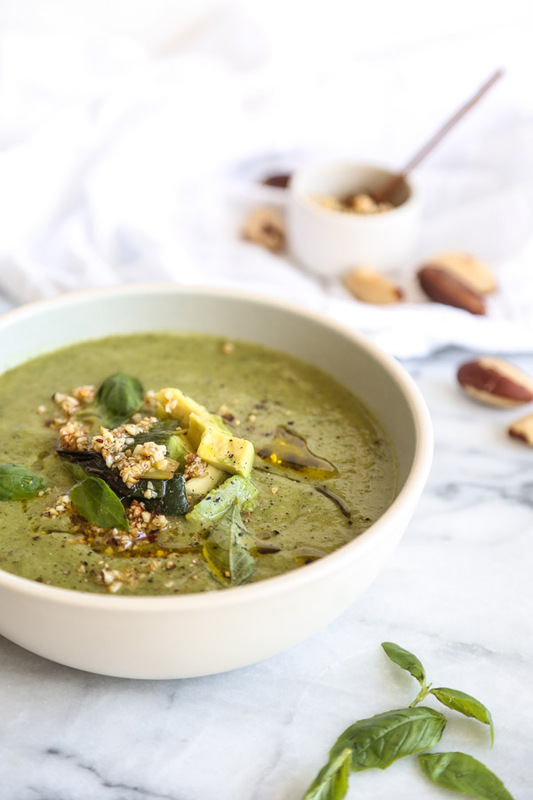 The best news of all for those of us stuck in swampier environs: this zucchini soup recipe requires less than 10 minutes of stove time. You can serve it at room temperature or chilled. And doing so somehow also seems to temper both jet lag and wanderlust. 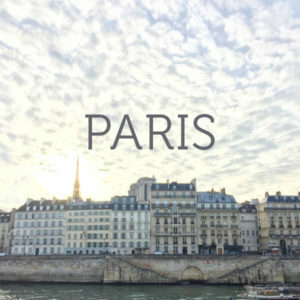 Do any of you have gluten-free travel tips? 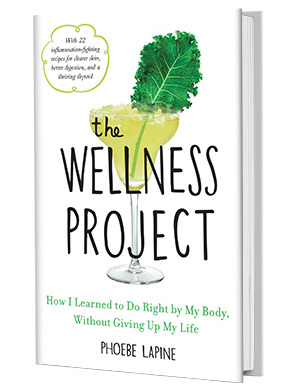 Or general advice on developing willpower while on the road? I’m all ears in the comments! 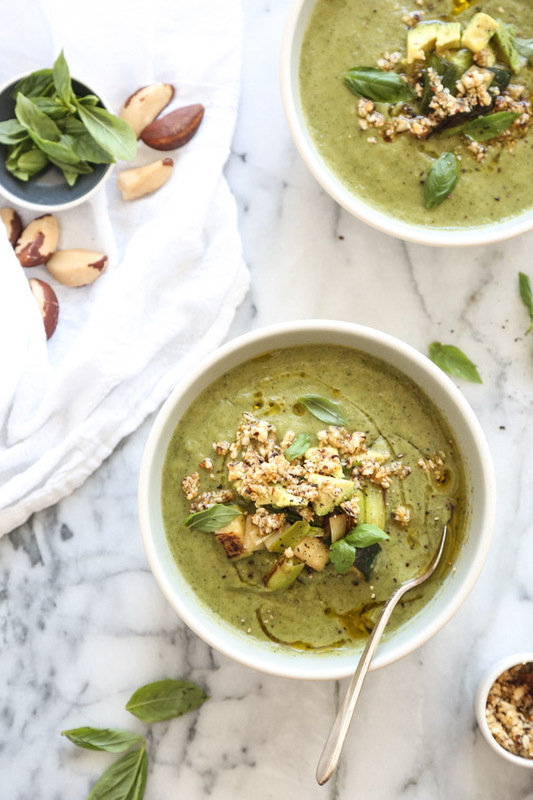 This creamy zucchini soup recipe is the perfect way to use up all that end of summer produce. 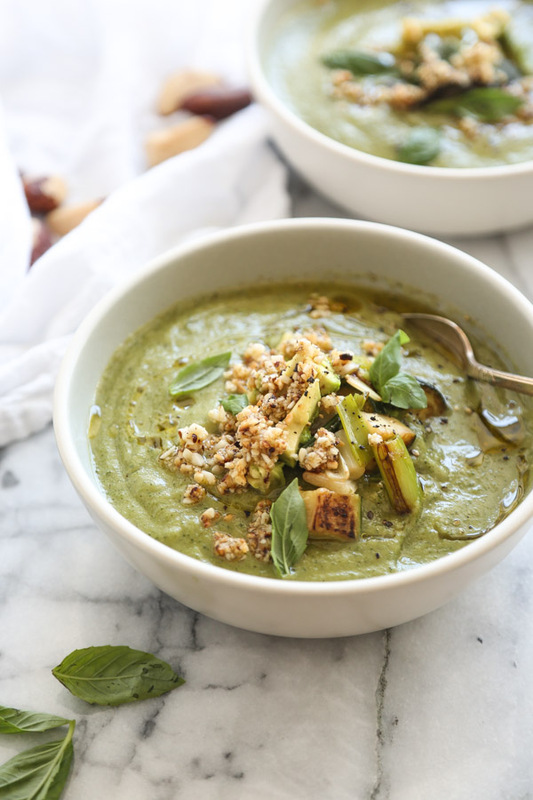 A little avocado is the secret ingredient to make it thick and luscious, while completely vegan. A whole bunch of scallions and basil add tons of flavor, and a quick garlicky brazil nut chili oil topping gives it crunch and heat. All in all, a perfect quick weeknight meal served hot or cold. 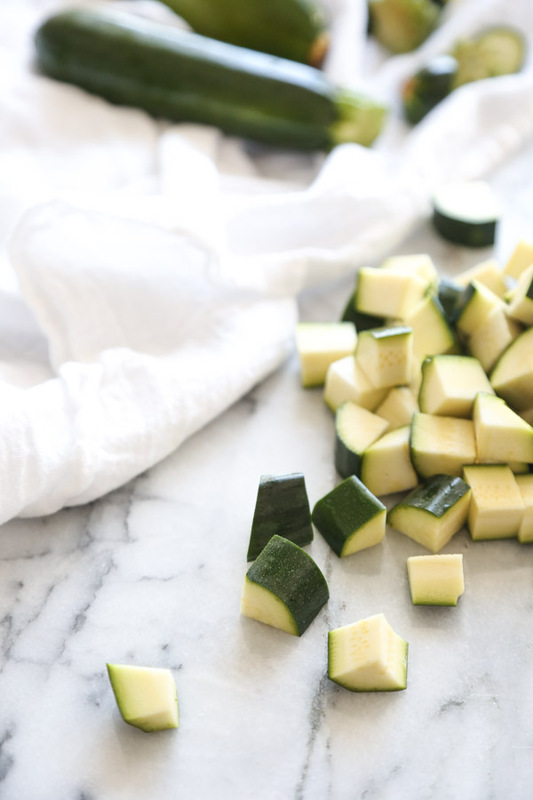 If you're making this as a smaller appetizer, it can serve 4. See notes for make-ahead thoughts. 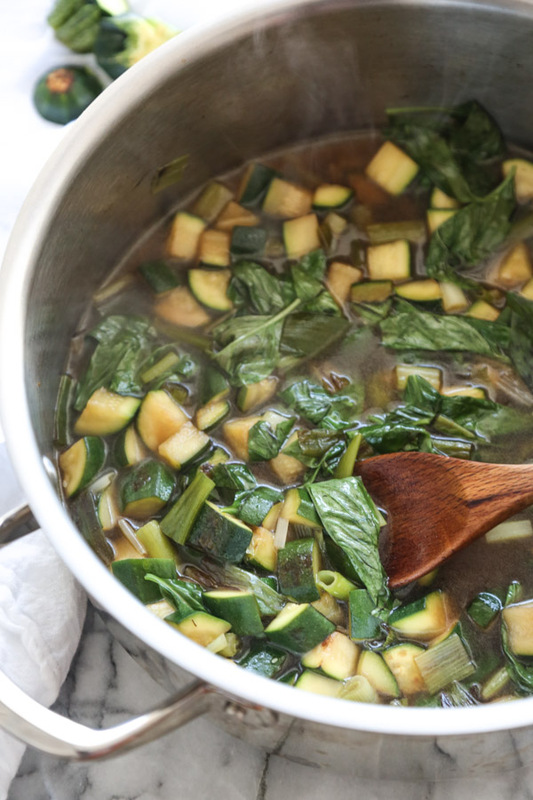 In a large lidded Dutch oven or stockpot, heat 1 tablespoon of olive oil. Add the scallions and zucchini. Sauté over medium-high heat until soft and slightly browned, 7 minutes. Season with 1/2 teaspoon salt. Remove 1/3 cup of the veggies and set aside. Add the stock and bring to a boil. Remove from the heat and stir in the basil and half the avocado. Puree the soup in batches in a stand blender, or directly in the pot using an immersion blender. Keep warm on the stove while you make the topping, or alternatively, transfer to a bowl and chill in the refrigerator if you want to enjoy it cold. In a small saucepan, heat 3 tablespoons of olive oil. 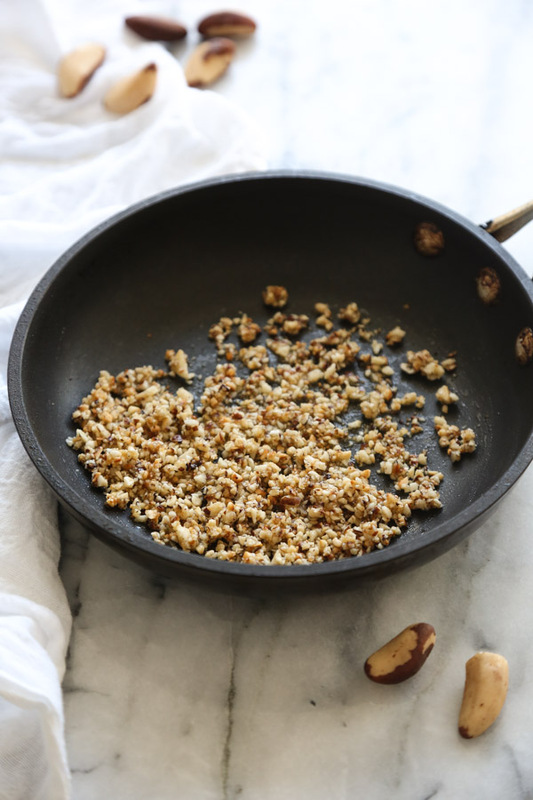 Add the garlic, brazil nuts and chili flakes. Stir fry over medium-high heat until the garlic and nuts are golden brown, about 1 minute. Remove to a bowl to stop the cooking and season lightly with salt. Stir the lemon juice into the soup right before you’re ready to serve (so the color is preserved), and divide it between 2 to 4 bowls. Top with the remaining avocado, reserved scallion-zucchini mixture, brazil nut chili oil and lemon zest, if using. - You can make the soup and topping up to 2 days in advance. Just omit the lemon juice until ready to serve so that the color stays a nice mellow green. 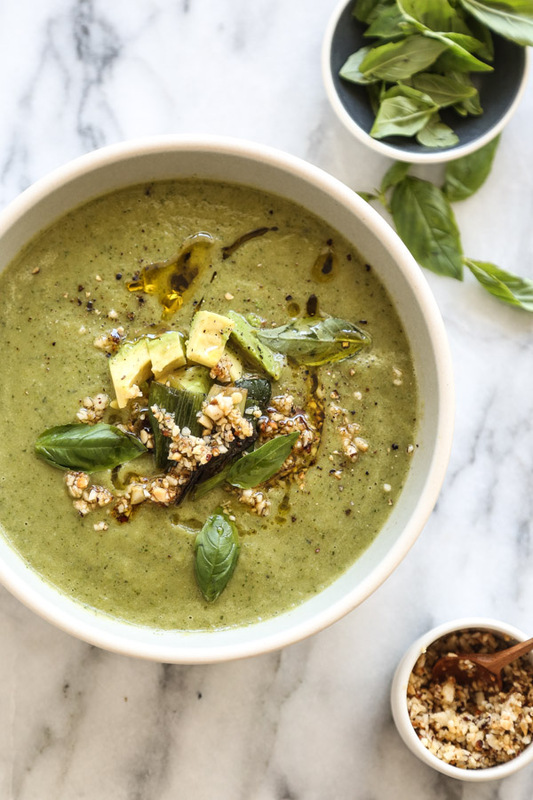 Usually, the acid helps keep avocados green, but it tends to turn herbs brown. So it’s a toss-up. - If you want to make this even creamier and lighter in tone, sub 1 cup almond milk for some of the stock. And if you’re not vegan or dairy-free, you could also substitute regular cow’s milk. When I travel, no matter how good the food where I’m going, I try to stick to my no-carbs-during-the-day regime, with the first meal featuring protein. So I don’t travel with bread, for starters! But I make an exception for hash browns or fries. I mean, come on. SRSLY? 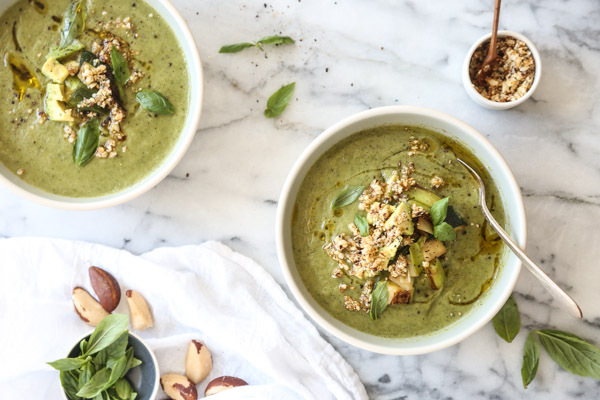 I mean, I love my veggies and this gorgeous soup, but I’m sorry those shenanigans are going down. I’m going to need a double serving to recover! Also I’m incredulous that you would lose Insta followers because of Charlie. Must be jealous. he’s too hot to handle! Dang! I have never heard of anyone traveling with their own bread in tow. You are committed, girlfriend! 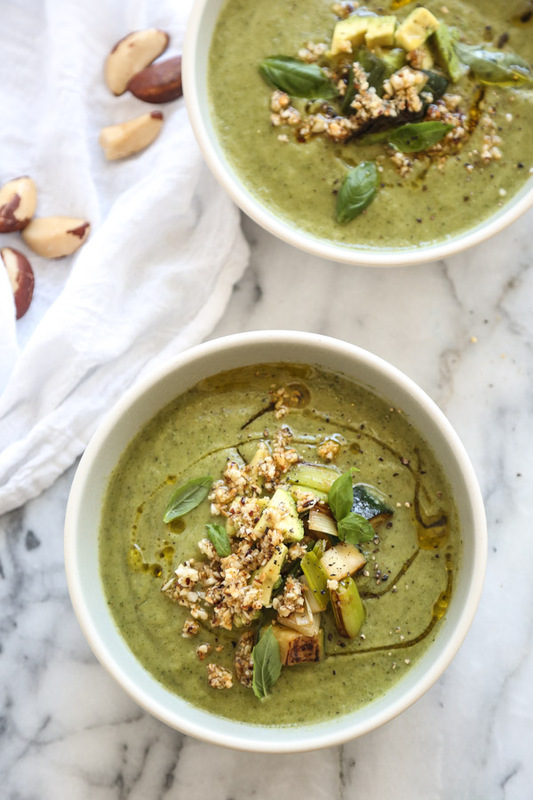 Love the green summery vibe of this soup. ha – desperate hangriness calls for desperate measures! This looks absolutely fantastic! And sounds like so much great food where you were!